Research in the Gormley Lab ranges from fundamental studies in self-assembly of nanomaterials to translational nanomedicine. See the research topics below. 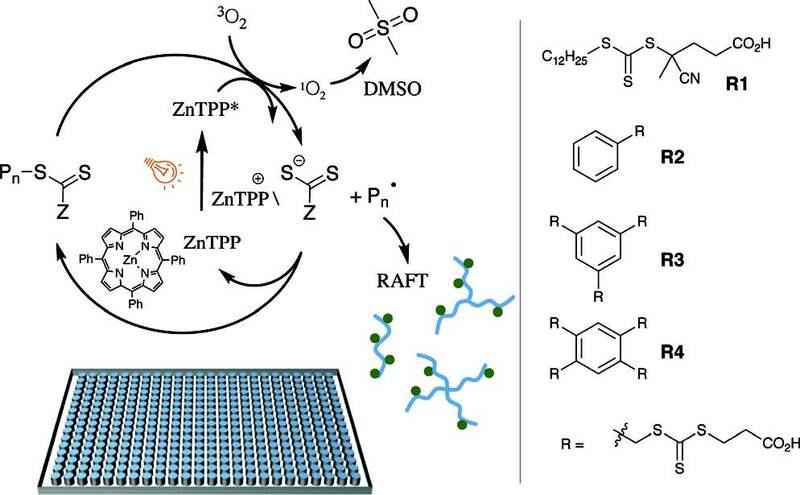 The aim of this research is to use our recent discovery of Enzyme-Assisted RAFT or Enz-RAFT polymerization for combinatorial polymer chemistry to develop nanobiomaterials in high-throughput. This research currently focuses on designing bioactive nanomedicines for the treatment of disease. The Gormley Lab also investigates fundamental advancements in macromolecular self-assembly in order to better structure nanomaterials in solution. Adam Gormley is an Assistant Professor of Biomedical Engineering at Rutgers University and an expert in nanobiomaterials. Prior to Rutgers, Adam was a Marie Skłodowska-Curie Research Fellow at the Karolinska Institutet (2016) and a Whitaker International Scholar at Imperial College London (2012-2015) in the laboratory of Professor Molly Stevens. He obtained his PhD in Bioengineering from the University of Utah in the laboratory of Professor Hamid Ghandehari (2012), and a BS in Mechanical Engineering from Lehigh University (2006). In January 2017, Adam started the Gormley Lab which seeks to develop bioactive nanobiomaterials for therapeutic and regenerative medicine applications. Shashank is a PhD student in Biomedical engineering department at Rutgers University. He has a Bachelor's degree in Chemical Engineering Technology from Osmania University (2014) and a Masters degree in Chemical and Biochemical engineering from Rutgers University(2016). He has a passion towards nanotechnology and believes there is a vast scope for nanotechnology in drug delivery. His Masters thesis focused on synthesizing polymer nanoparticles for heavy metal ion removal purposes from waste water and is am planning to pursue his doctoral degree in the field of drug delivery using nano-inspired biomaterials. Matt Tamasi is an Undergraduate student studying Biomedical Engineering at Rutgers School of Engineering. Currently, Matt is interested in advancing his studies with knowledge in Tissue Engineering and Nanotechnology for regenerative and therapeutic methods, as well as an interest in Biomechanics and physical rehabilitation. .Jason DiStefano is an Undergraduate student studying Biomedical Engineering on a Pre-Medical track at Rutgers School of Engineering. He is interested in the advancement of cancer research with nanoparticles. His goal is to find a way to make Helper T cells fight cancer. This would allow patients to fight cancer without harming other tissues in their body. Kelsey Farbanish is an undergraduate student studying Chemical Engineering at Rutgers School of Engineering. She is also a member of the Rutgers’ Women Cross Country and Track Teams. Kelsey is planning to pursue a Masters in Chemical Engineering with a focus on Pharmaceutical Engineering. Rahul is a PhD student in Biomedical Engineering at Rutgers University. He obtained a B.S. in Biomedical Engineering from the University of Rochester in 2017. Some of Rahul's prior research included a project involving polymeric gene therapy, and he hopes to focus his graduate work on studying drug delivery and nanomaterials. He hopes to one day utilize the skills and techniques he learns in academic research to pharmaceutical industry. Mythili Kanagala is an undergraduate student on the pre-medical track majoring in Biomedical Engineering and minoring in Health Administration and Chemistry at Rutgers School of Engineering. She is interested in research relating to nanomedicine and drug delivery and is fascinated to see how this will shape the treatments for different types of cancer and cardiovascular diseases. Tim is an MS student in Biomedical Engineering. He obtained his BS degree in Biomedical Engineering from Rutgers University in 2017. His past research experience is in the development of pH-responsive liposomes for enhanced penetration of chemotherapeutic drugs in solid tumors. He hopes to continue studying nanoparticles for use in drug delivery and regenerative medicine while in graduate school and hopes to one day earn a PhD specializing in this area. Supriya joined the group as a postdoc in Jan 2019. Supriya received his BSc in Chemistry from Bankura Sammilani College in 2010. He obtained his MSc in Chemistry in 2012 from IIT Madras, India. He then moved to the United States to pursue his Ph.D. in Chemistry at Rutgers University. Supriya received his Ph.D. degree in Chemistry on December 2018 from Rutgers University where his research was focused on plasmonic nanoparticles syntheses and catalytic applications. His current research interest involves designing experiments to synthesize biopolymers to mimic the natural protein functionality. S. Oliver, et al., 2019. Macromolecules. 52: 3-23. The requirement for deoxygenation in controlled/living radical polymerisation (CLRP) places significant limitations on its widespread implementation by necessitating the use of large reaction volumes, sealed reaction vessels as well as requiring access to specialised equipment such as a glove box and/or inert gas source. As a result, in recent years there has been intense interest in developing strategies for overcoming the effects of oxygen inhibition in CLRP and therefore remove the necessity for deoxygenation. 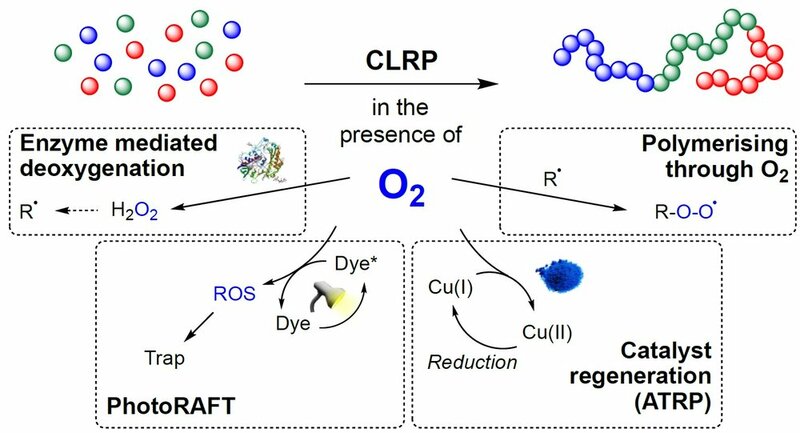 In this review, we highlight several strategies that have already been proposed for achieving oxygen tolerant CLRP including: “polymerising through” oxygen, enzyme mediated deoxygenation and the continuous regeneration of a redox-active catalyst. In order to provide further clarity to the field, we also establish some basic parameters for evaluating the degree of “oxygen tolerance” that can be achieved using a given oxygen scrubbing strategy. Finally, we propose some applications that could most benefit from the implementation of oxygen tolerant CLRP and provide a perspective on the future direction of this field. J. Yeow, et al., 2018. 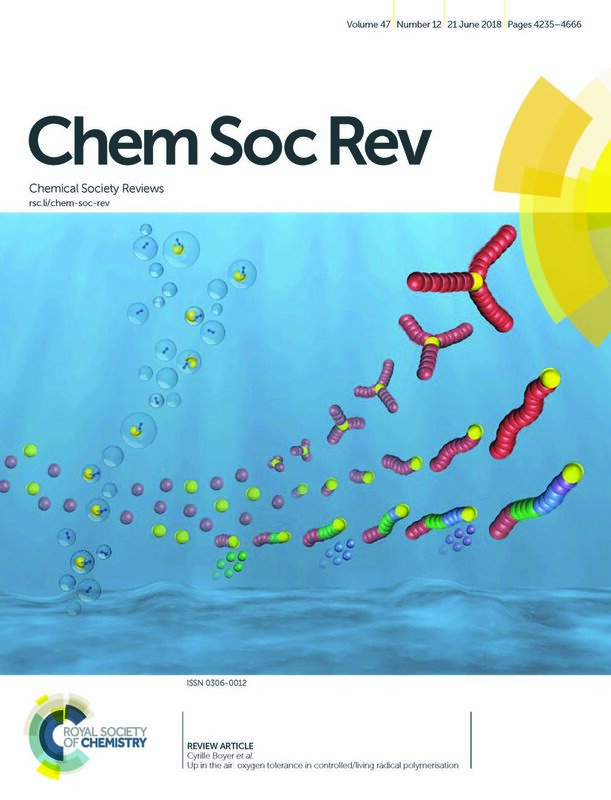 Chemical Society Reviews. 47: 4357-4387. The complexity of polymer–protein interactions makes rational design of the best polymer architecture for any given biointerface extremely challenging, and the high throughput synthesis and screening of polymers has emerged as an attractive alternative. A porphyrin-catalysed photoinduced electron/energy transfer–reversible addition-fragmentation chain-transfer (PET-RAFT) polymerisation was adapted to enable high throughput synthesis of complex polymer architectures in dimethyl sulfoxide (DMSO) on low-volume well plates in the presence of air. The polymerisation system shows remarkable oxygen tolerance, and excellent control of functional 3- and 4-arm star polymers.We then apply this method to investigate the effect of polymer structure on protein binding, in this case to the lectin concanavalin A (ConA). Such an approach could be applied to screen the structure–activity relationships for any number of polymer–protein interactions. A.J. Gormley, et al., 2018. 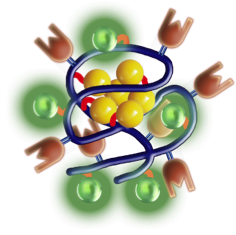 Angewandte Chemie Int. Ed. 57: 1-7. The synthesis of well-defined polymers in a low-volume, combinatorial fashion has long been a goal in polymer chemistry. Here, we report the preparation of a wide range of highly controlled homo and block co-polymers by Enz-RAFT (enzyme-assisted reversible addition–fragmentation chain transfer) polymerization in microtiter plates in the open atmosphere. The addition of 1 μmglucose oxidase (GOx) to water/solvent mixtures enables polymerization reactions to proceed in extremely low volumes (40 μL) and low radical concentrations. This procedure provides excellent control and high conversions across a range of monomer families and molecular weights, thus avoiding the need to purify for screening applications. This simple technique enables combinatorial polymer synthesis in microtiter plates on the benchtop without the need of highly specialized synthesizers and at much lower volumes than is currently possible by any other technique. R. Chapman and A.J. Gormley, et al., 2016. Angewandte Chemie. 128: 4576-4579. The layer-by-layer (LbL) technique is a simple and robust process for fabricating functional multilayer thin films. Here, we report the use of de novo designed polypeptides that self-assemble into coiled-coil structures (four-helix bundles) as a driving force for specific multilayer assembly. These pH- (sensitive between pH 4 and 7) and enzyme-responsive polypeptides were conjugated to polymers, and the LbL assembly of the polymer–peptide conjugates allowed the deposition of up to four polymer–peptide layers on planar surfaces and colloidal substrates. Stable hollow capsules were obtained, and by taking advantage of the peptide’s susceptibility to specific enzymatic cleavage, release of encapsulated cargo within the carriers can be triggered within 2 h in the presence of matrix metalloproteinase-7. The enormous diversity of materials that can form highly controllable and programmable coiled-coil interactions creates new opportunities and allows further exploration of the multilayer assembly and the formation of carrier capsules with unique functional properties. A.J. Gormley, et al., 2015. Chemistry of Materials. 27: 5820–5824. Efficient signal amplification processes are key to the design of sensitive assays for biomolecule detection. Here, we describe a new assay platform that takes advantage of both polymerization reactions and the aggregation of nanoparticles to amplify signal. In our design, a cascade is set up in which radicals generated by either enzymes or metal ions are polymerized to form polymers that can entangle multiple gold nanoparticles (AuNPs) into aggregates, resulting in a visible color change. Less than 0.05% monomer-to-polymer conversion is required to initiate aggregation, providing high sensitivity toward the radical generating species. Good sensitivity of this assay toward horseradish peroxidase, catalase, and parts per billion concentrations of iron and copper is shown. Incorporation of the oxygen-consuming enzyme glucose oxidase (GOx), enables this assay to be performed in open air conditions at ambient temperature. We anticipate that such a design will provide a useful platform for sensitive detection of a broad range of biomolecules through polymerization-based amplification. A.J. Gormley* and R. Chapman*, et al., 2014. Nano Letters. 14: 6368–6373. Intolerance to oxygen is a key limitation in many reactions and particularly in controlled radical polymerizations. Here we introduce the use of enzymes such as glucose oxidase (GOx) to deoxygenate reversible addition–fragmentation chain transfer polymerizations (Enz-RAFT), facilitating the preparation of highly controlled polymers in vessels open to ambient oxygen. 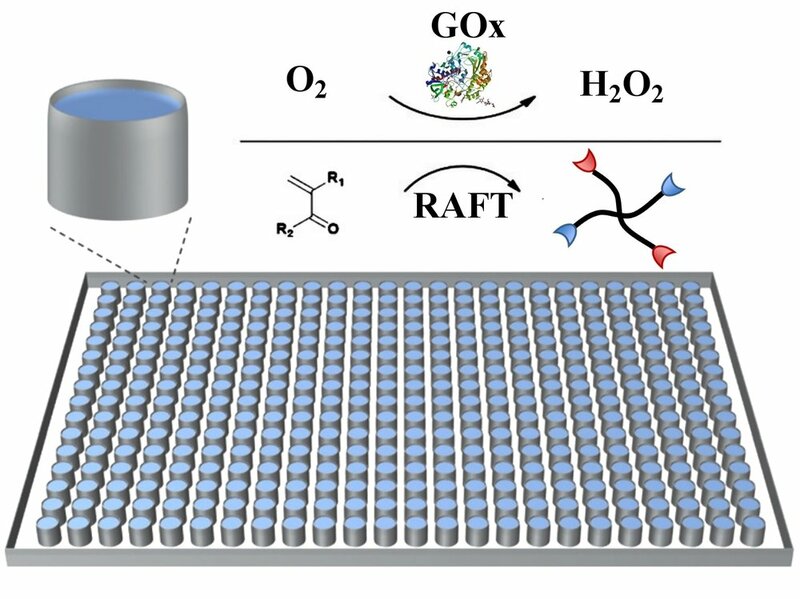 Because the removal of oxygen is so efficient, very low concentrations of GOx and initiator can be used, enabling excellent control which is demonstrated by pseudoliving polymerization kinetics and the preparation of multiblock copolymers with narrow molecular weight distributions (Mw/Mn < 1.15). GOx retains sufficient activity to facilitate polymerization not only in aqueous solutions but also in a range of water/organic solvent mixtures, and we demonstrate the use of this technique to perform open vessel Enz-RAFT polymerizations in various methanol and dioxane/water mixtures. R. Chapman* and A.J. Gormley*, et al., 2014. Macromolecules. 47: 8541-8547. K.Z. Meidell, R. Robinson, A. Vieira‐de‐Abreu, A.J. Gormley, H. Ghandehari, D.W. Grainger, R.A. Campbell, 2017. RGDfK‐functionalized gold nanorods bind only to activated platelets. Journal of Biomedical Materials Research Part A. 105: 209-217. P. Campagnolo, A.J. Gormley, L.W. Chow, A.G. Guex, P.A. Parmar, J.L. Puetzer, J.A.M. Steele, A. Breant, P. Madeddu, M.M. Stevens, 2016. Pericyte seeded dual peptide scaffold with improved endothelialization for vascular graft tissue engineering. Advanced Healthcare Materials. 5: 3046-3055. R.H. Harrison, J.A.M. Steele, R. Chapman, A.J. Gormley, L.W. Chow, M.M. Mahat, L. Podhorska, R.G. Palgrave, D.J. Payne, S.P. Hettiaratchy, I.E. Dunlop, M.M. Stevens, 2015. Modular and Versatile Spatial Functionalization of Tissue Engineering Scaffolds through Fiber-Initiated Controlled Radical Polymerization. Advanced Functional Materials. 25: 5748-5757. B. Buckway, N. Frazier, A.J. Gormley, A. Ray, H. Ghandehari, 2014. Gold nanorod-mediated hyperthermia enhances the efficacy of HPMA copolymer – 90Y conjugates in treatment of prostate tumors. Nuclear Medicine and Biology. 41:282-289. C-M. Horejs, A. Serio, A. Purvis, A.J. Gormley, S. Bertazzo, A. Poliniewicz, A.J. Wang, P. DiMaggio, E. Hohenester, M.M. Stevens, 2014. Biologically active laminin-111 fragment that modulates the epithelial-to-mesenchymal transition in embryonic stem cells. Proceedings of the National Academy of Sciences. 111: 5908-5913. N. Larson, A.J. Gormley, N. Frazier, H. Ghandehari, 2013. Synergistic enhancement of cancer therapy using a combination of heat shock protein targeted HPMA copolymer-drug conjugates and gold nanorod induced hyperthermia. Journal of Controlled Release. 170: 41-50. A.J. Gormley, N. Larson, A. Banisadr, R. Robinson, N. Frazier, A. Ray, H. Ghandehari, 2013. Plasmonic photothermal therapy increases the tumor mass penetration of HPMA copolymers. Journal of Controlled Release. 166: 130-138. A.J. Gormley*, N. Larson*, A. Ray, R. Robinson, S. Sadekar, H. Ghandehari, 2012. Guided delivery of polymer therapeutics using plasmonic photothermal therapy. Nano Today. 7: 158-167. A.J. Gormley, A. Malugin, A. Ray, R. Robinson, H. Ghandehari, 2011. Biological evaluation of RGDfK – gold nanorod conjugates for prostate cancer treatment. Journal of Drug Targeting. 19: 915-924. A.J. Gormley, K. Greish, A. Ray, R. Robinson, J.A. Gustafson, H. Ghandehari, 2011. Gold nanorod mediated plasmonic photothermal therapy: A tool to enhance macromolecular delivery. International Journal of Pharmaceutics. 415: 315-8. January 16, 2019: Welcome to the lab Supriya Atta as the lab’s first post doc!! He joins us from Laura Fabris’ lab in Materials Science. We look forward to working with you and doing great science! 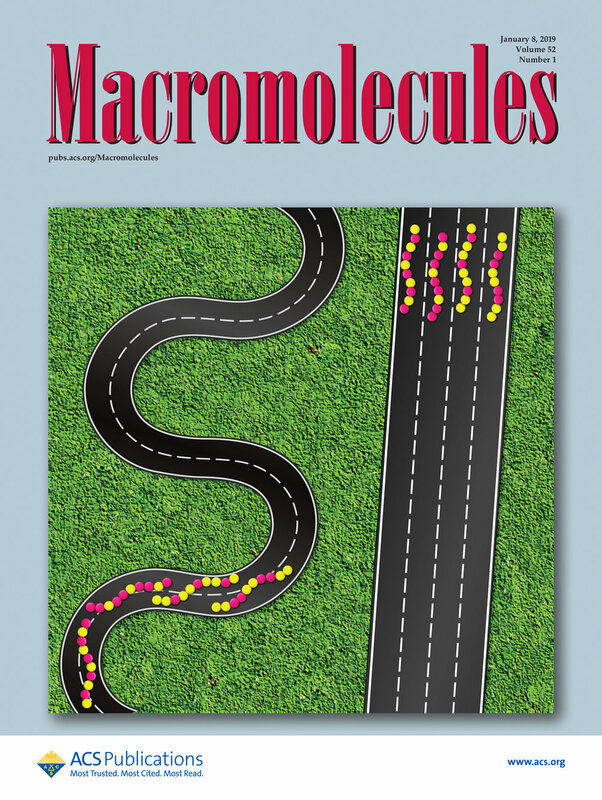 December 27, 2018: New review article from the Gormley Lab and collaborators on the front cover of Macromolecules! 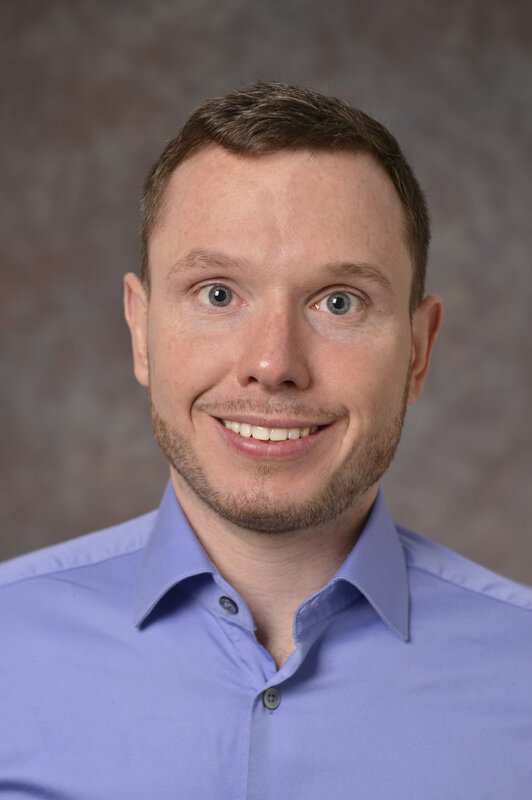 Assistant Professor Adam Gormley has been awarded two grants from the New Jersey Health Foundation to support his lab’s work in diagnostics and polymer chemistry. The first is a $35,000 Research Grants award to support their development of low cost and point-of-care diagnostics to differentiate bacterial vs. viral infections. The second award is a $50,000 Innovation Grant to support their highly innovative and automated polymer chemistry. August 9, 2018: The Gormley Lab had its first lab retreat hiking through the Delaware Water Gap! July 11, 2018: Major congratulations to Matt and Rahul this week for earning prestigious fellowships!! Rahul was selected for a Biotechnology Training Program Fellowship and Matt was selected for a GAANN Fellowship! Both of these are a testament to each of their strengths as scientists and students. Very well deserved indeed! June 21, 2018: The Gormley Lab has published an exciting review article on oxygen tolerant polymerizations in Chemical Society Reviews in collaboration with teams at the University of New South Wales. Click on the cover art to the right to access the review! Exciting press release information on our MGH Prize for Primary Care! December 20, 2017: Major congratulations to the all-star senior design team (Neel, Charles, Sarah and Sudeepti) for winning Second Place in the final MGH Student Technology Prize for Primary Care Competition with a $50,000 award!!! October 9, 2017: Tim Mahon has joined the lab to do his Master's degree. Welcome to the lab Tim! September 22, 2017: The Gormley Lab senior design team including Neel, Charles, Sarah and Sudeepti presented their project to the Namibian delegation including Prime Minister Saara Kuugongelwa! Such a cool opportunity to meet with a world leader and talk about their exciting work. More exciting news for the Gormley Lab which has been awarded an American Cancer Society – Institutional Research Grant Early Investigator Pilot Award. This one-year $50,000 grant is helping Prof. Adam Gormley’s lab develop bioactive nanomedicines that target receptor proteins on cancer cells. The Gormley Lab has been awarded a two-year, $40,000 Busch Biomedical Grant. Dr. Gormley’s lab is developing novel polymers that can interface with and manipulate receptor proteins as therapeutics. This Busch Biomedical Award will help the Gormley Lab establish this technology and create a new generation of therapeutics using state-of-the-art materials science techniques. July 12, 2017: The Gormley Lab had its first BBQ! It has been a great summer with Shashank, Matt, Jason, Kelsey, Phil and Rahul all pitching in! May 30, 2017: Congratulations to the Gormly Lab senior design team for placing top 5 in the MGH Student Technology Prize for Primary Healthcare competition! Well done Neel, Charles, Sarah and Sudeepti! Mar 2, 2017: Our newest lab member, Jason DiStefano, has joined the lab. Welcome Jason! Jan 20, 2017: Three new students join the Gormley Lab. Welcome Elisheva, Shashank and Matt! Jan 1, 2017: Gormley Lab opens at Rutgers University!